On 28 May 2017 participants gathered at the Canadian Historical Association’s annual conference to join a conversation about the Confederation of Canada. Specifically, we asked attendees to consider ways that we might decolonize not only the events of 150 years ago, but simultaneously the society we live in today. This blog post is meant to re-cap the event for those who could not attend and to encourage us to continue to think critically about 1867, the implications of Confederation for Indigenous people, and the Canadian community as a whole. [I] would like to begin by acknowledging that the land on which we gather is the traditional territory of the Haudenosaunee, Wendat, and most recently, the territory of the Mississaugas of the New Credit First Nation. The territory was the subject of the Dish With One Spoon Wampum Belt Covenant, an agreement between the Iroquois Confederacy and the Ojibwe and allied nations to peaceably share and care for the resources around the Great Lakes. This territory is also covered by the Upper Canada Treaties. Today, the meeting place of Toronto (from the Haudenosaunee word Tkaronto) is still the home to many Indigenous people from across Turtle Island and we are grateful to have the opportunity to work in the community, on this territory. This evening we are honoured to have clear examples that 470 years later, the customs of this country remain. They did not begin 150 years ago, but are rooted in the historical and cultural landscape since Time Immemorial. 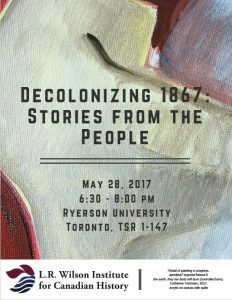 This evening we invite you to join us in an attempt to decolonize 1867 by circularizing the people and places of what we call Canada. The year of Confederation is lodged in a linear trajectory towards “modernity” and “civilization.” Tonight we ask you to reorient yourself by seeking out patterns and processes rather than progress. We ask you to sit with us in this circle, to listen to the speakers, and then, be brave and contribute to the conversation. We have asked the presenters to sit among us to reinforce values of inclusivity, circularity, and equality. The program is modelled after a talking circle. Each speaker (in no specific order) will introduce themselves and deliver their presentation. The Feather will then be turned over to the audience. After Labelle’s remarks, Catherine Tammaro, Communications Officer for the Wyandot of Anderdon Nation, was the first to take the feather. She shared with the group a powerful painting representing her vision of colonialism in the Wyandot worldview, detail from which is represented in the poster of the event. Helen Knott, a poet of Dane Zaa, Nehiyaw, and mixed Euro descent from Prophet River First Nation, then enchanted her audience with two spoken word poetry pieces that tie into the Decolonizing 1867 theme. Her poetry functions as a call to action, and listeners cannot help but reflect on the legacies of colonization for Indigenous communities. Jesse Thistle, an award-winning Métis doctoral student from northern Saskatchewan (and, now, York University), reminded attendees that Canada is a colonial state. Thistle shared his family’s history of dispossession alongside Dr. Carolyn Podruchny, an associate professor at York University. The two wove together oral testimony and textual sources to reveal how Canada systematically eroded Métis rights after 1867. Before closing, Thistle and Podruchny celebrated the strength of the Métis Nation. Thistle sat before us (a testament to Métis survival), in partnership with a settler-scholar, to raise awareness about social inequity and demand a better future for Indigenous peoples. Dr. Brittany Luby is an assistant professor at the University of Guelph whose paternal ancestors originated from Ochiichagwe’Babigo’Ining Ojibway Nation. Building off her PhD dissertation, which one this year’s John Bullen Prize, Luby’s presentation was titled: “A Most Convenient Oversight: An Examination of How the Crown Misconstrued “Appropriate” to Reduce Indian Reserve Lands in Ontario, 1873 – Present.” Luby compellingly recounted what could otherwise have been overlooked as bureaucratic processes to demonstrate the incredible power of settler institutions in shaping the processes of colonization, even if unintentionally through grammatical choices. Naomi Recollet is a graduate student at the University of Toronto. Her presentation was titled: “Reflecting back on 1836 to understand ‘Decolonizing 1867’: one interpretation from Wiikwemkoong Unceded Territory.” Recollet is a filmmaker who created the film Unceded and, in addition to sharing part of the film, she shared with those in attendance the process she undertook to create it and the work she has done to share knowledge about wampum belts across multiple communities. I don’t know that any other panels at the CHA will be organized in this way. I just came from the CHA business meeting and this was something very different. Sitting in a circle; passing a feather; presentations beyond academic papers (including painting, film, and poetry) have created a different environment entirely. I’m glad that this event took place at the beginning of the conference because I will take this conversation with me over the next few days. These presentations will feed my future conversations and I hope more events like this might shape at the CHA in the future. Thank you all for being a part of this event and the ongoing process of decolonization. We’re not finished – we still have work to do! We ask you, as participants, to share with us your thoughts and observations from this event. We announced this event and provided some preparatory context for it on ActiveHistory.ca and will be following up with a second post to process the event. We will also be working with today’s presenters and additional contributors to publish a collected edition of works on decolonizing 1867 with McGill-Queen’s Press. Thank you all for being here today – we look forward to hearing from you! Individually, we encourage you to take this beyond ActiveHistory.ca, the Ryerson classroom and the CHA. Continue the conversation with family, friends, students, and colleagues. The community in what is now known as Canada has come a long way since 1867, but it still has a long way to go. Decolonization is key to the Reconciliation process and we hope that this event has contributed to this. But, decolonization cannot occur in one room on one night. Moving forward, read, write, and talk about the legacy of 1867. Choose whichever communication method allows you to best spread shared knowledge. Be brave—take up the feather—join the circle! We were looking forward to Ryan McMahon with Indian and Cowboy podcast sharing an audio version of this event, but due to scheduling challenges and sick children, we weren’t able to make this collaboration happen, but we look forward to working with Ryan in the future!